The first season of AMC’s The Walking Dead, based on Robert Kirkman’s hit comic book gore fest of the same name, cleaned up in the ratings and kept fans biting their nails on the edge of their sofas. Developed by veteran director Frank Darabont, together with Kirkman, the highly anticipated first season premiered on AMC to universal acclaim in October 2010, setting a record audience for a cable show premiere. Albeit way too short (a paltry six episodes, eliciting a collective groan from fans and critics alike) the not-for-the-squeamish show jumped right into the action. Initially sticking close to the comic, it developed characters, themes, and storylines made only for the TV version. 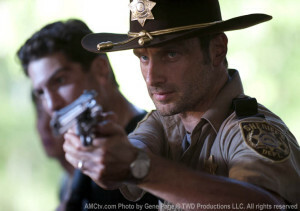 The show follows Rick Grimes, a lion-hearted sheriff’s deputy from Georgia, as he got shot in the line of duty, then awakened from a coma in an abandoned hospital. He found his family and then led them and a small band of survivors to safety through the aftermath of a zombie apocalypse. The Walking Dead delivered the goods: coming in the wake of Lost, the show helped satisfy fans’ craving for a diverse group (old, young, pre-teen, black, Asian, blonde, redneck, etc. ), each with his or her own backdrop story to tell, struggling their way out of a helpless situation. The survivors dealt with infighting, romance, the daily grind of scrounging for food and weapons, and most of all, well…zombies. Where Lost had the villainous “Others,” The Walking Dead upped the ante and put forth the most horrifyingly evil and dangerous cast of villains ever shown on TV: shuffling masses of brainless, gut-chomping, intestine-ripping “walkers” (called so for their habit of endlessly wandering and being incapable of physically tiring). With outstretched arms seeking live flesh, they are slow, nameless, and deadly. As it seems, a bite from a walker turns a victim into a walker himself. 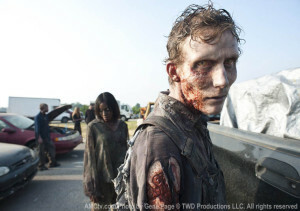 Over the six episodes, aired back-to-back, the show raised the bar for gore-splattering special effects and makeup as we watched the walkers, in varying stages of decay, feast, or get killed from head-bursting gunshots and blood-spraying decapitations. 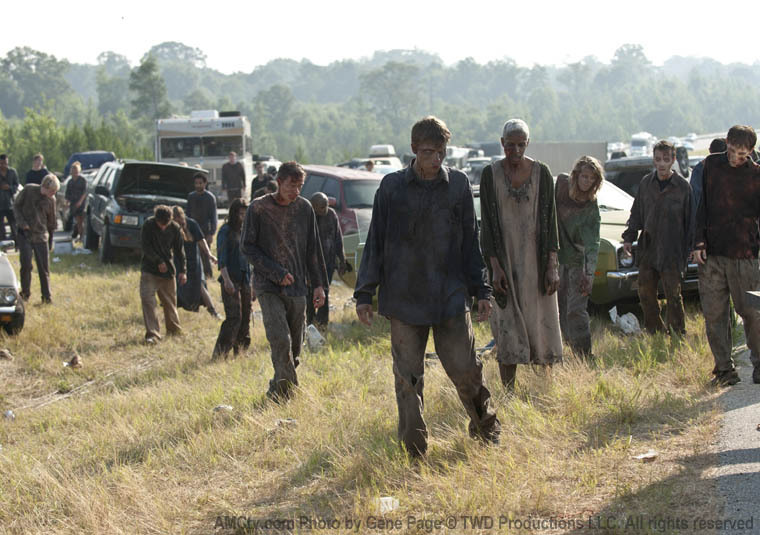 By the last episode in season one (“TS-19”), the survivors’ ranks were thinning out due to walkers and suicide. Trapped in Atlanta’s Centers for Diseases Control and Prevention (CDC) – where they arrived in a futile attempt to find a cure for the zombie plague – the group used a grenade to blast their way out of the fortress-like government center before it self-destructed. They fled Atlanta to begin a nervous, uncertain pilgrimage to Fort Benning in the hopes of finding a safe zone. Thankfully, for season two, the top-notch main cast signed on to continue. 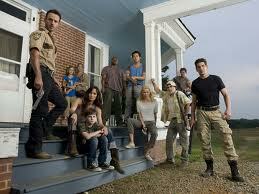 Among them are native Englishman Andrew Lincoln (who should win an award just doing such a marvelously convincing American accent) as the take-charge Rick; Sarah Wayne Callies as his pretty wife Lori; Jon Bernthal as his best friend and co-deputy Shane Walsh (who had an affair with Lori before Rick turned up alive); Steven Yeun as Glenn, the delivery boy turned resourceful street rat; Laurie Holden as despairing Andrea; Jeffrey DeMunn as the elderly and life-experienced Dale; IronE Singleton as T-Dog, an amiable, stocky black guy; Melissa McBride and Madison Lintz as gentle widow Carol and her pre-teen daughter Sophia, Norman Reedus as Daryl Dixon, a redneck alpha male archer and already a fan favorite; plus Chandler Riggs as Rick and Lori’s pre-teen son Carl.